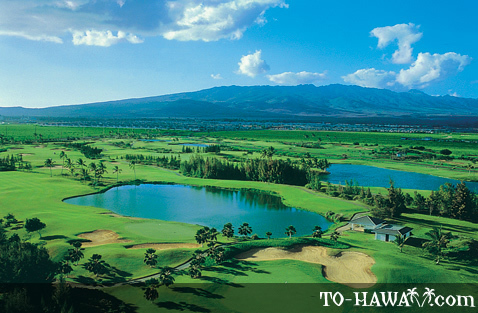 The Hawaii Prince Golf Club is located on the Ewa Plain, about forty minutes from Waikiki, and is comprised of 270 acres of long, lush fairways. The course is lined with ten strategically-located lakes, 90 well-placed white sand bunkers, and beautifully-manicured greens. The course was created from land that once produced sugar cane and was designed by Arnold Palmer and Ed Seay who were given the land. The entire course, which opened in 1992, is one of great beauty, character, and variety. 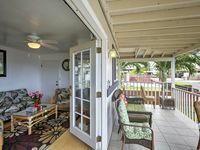 It provides players with magnificent views of the Waianae Mountains from this sunny part of Oahu – an oasis that enjoys minimal rain and fresh, cooling trade winds. 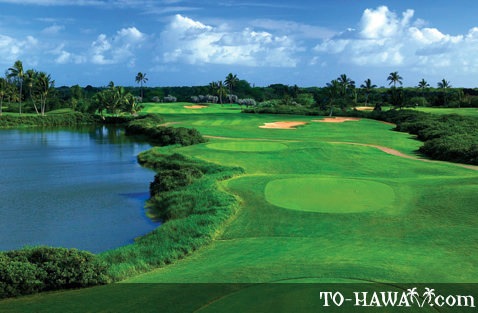 The only course of its kind in Hawaii, there are 27 dramatic holes to negotiate at the Hawaii Prince Golf Club. The course is unique in that it offers three nine-hole interchangeable layouts that can be played in different combinations. Each combination provides a variety of conditions and a memorable golf experience for all players whatever their skills level. The signature holes on the course are 1) the 398-yard, par-4 A7 hole; 2) the 403-yard, par-4 B9 hole; the 446-yard, par-4 C2 hole; and the 183-yard par-3 C7 hole. Although related, each of the three nine-hole courses – A, B, and C – has its own identity with water coming into play at six holes on the A course, at three holes on the B course, and at seven holes on the C course. The A-C combination is considered the most difficult while the A-B combination is thought the least challenging. The putting greens on all three courses are amongst the fastest in Hawaii. Visitors to the Hawaii Prince Golf Club can avail of a great range of services including shoe and club hire options and a complimentary shuttle service from selected locations. 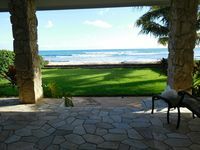 There is also an excellent practice range, locker rooms, and shower facilities. Those wishing to take up golf or improve their game can invest in lessons, which are provided by experienced and friendly professionals. The pro shop has a good range of apparel and logoed merchandise. 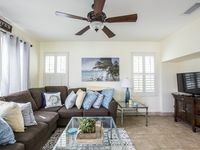 The full-service clubhouse includes a superb restaurant called The Bird of Paradise where hungry and/or thirsty golfers can enjoy lunch or a selection of cocktails before or after their game.